U.S. Dry Aging Beef Market was valued at $10,446 million in 2015, and is expected to reach $11,176 million by 2020, supported by a CAGR of 1.3% during the forecast period 2016 to 2020. Dry aging beef is a process in which the beef is placed or hung on racks for several weeks to facilitate drying. Primal (large distinct sections) or subprimal cuts, such as strip loins, sirloin, and rib eyes, are placed in refrigeration units to facilitate drying. This process incurs significant expenses, as beef must be stored at near freezing temperatures. Subprimal cuts are dry aged on racks in specially designed climate-controlled coolers. In addition, dry aging can be done in moisture-permeable drybags. This process involves the use of high grade meat with evenly distributed fat content. Hence, dry aged beef is available in steak restaurants and upscale butcher shops or grocery stores. Factors such as increase in number of restaurants, rich flavor of dry aged beef, change in consumer preference towards uniquely flavored products, and rise in disposable income are expected to drive the market. However, requirement of large storage space for beef and refrigerators is expected to hamper the growth of the dry aging beef market in the U.S. Furthermore, dry aged beef accounts for less than 10% of the total beef consumption in the U.S. 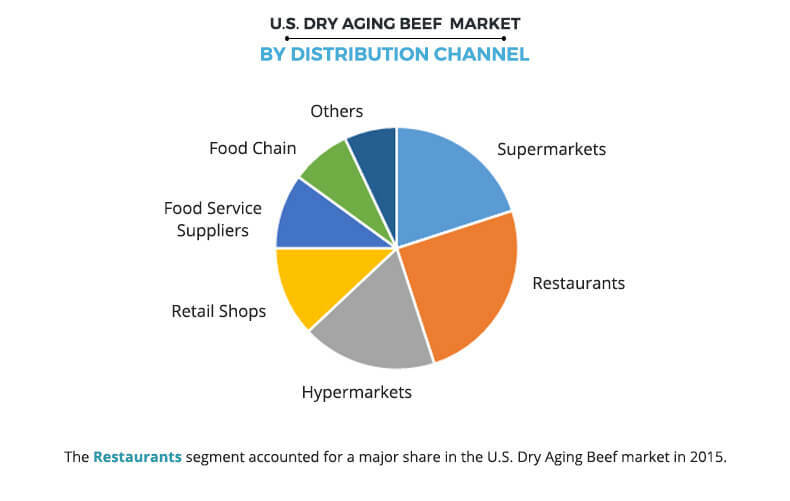 In addition, the demand for dry aging beef is expected to increase owing to the increase in demand for protein-rich food products and rise in consumer inclination towards premium products. 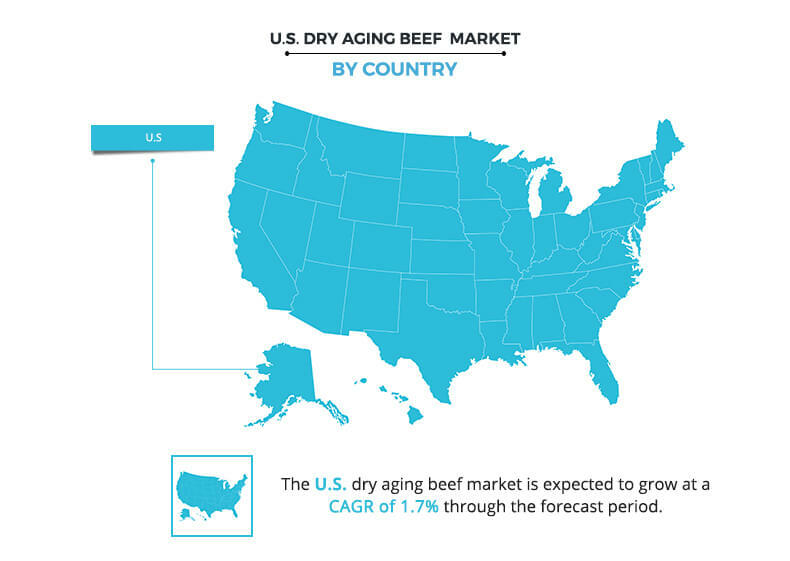 The U.S. dry aging beef packaging market is expected to grow at a CAGR of 1.7% during the forecast period. Dry aging beef was a primeval process of producing high-quality beef in the U.S. for being marketed to high-end customers. This technique offers the most unique quality of providing distinctive dry aging flavor to beef. Increased consumption of beef due to expansion in trading business has boosted the packaging business. Dry aging beef bag is a specially formulated combination of polymers, which act as a membrane to ensure permeability of moisture and oxygen. The inner layer of the dry aging beef bag forms a bond with the proteins on the surface of the meat within the first few days. Once bonded, it provides protection against contamination and off flavors, and reduces the risk of anaerobic bacterial growth. This allows market players to dry age the beef in commercial refrigeration units without the need for specialized humidity control. Several authorities have imposed stringent rules and regulations for vendors operating in the U.S. packaging market. These rules pertain to permits, regulations on new entrants, and expiry dates for perishable products. High demand for beef among consumers is the major factor that drives the U.S. market. In addition, the retail prices of beef have increased in the recent years, resulting in significant revenue generation in the U.S. market. According to the U.S. Department of Agriculture, the export of beef from the U.S. was valued at $7 billion and $6 billion in 2014 and 2015, respectively. Some of the key players in the industry are DrybagSTeak, LLC., DeBragga, The Ventura Meat Company, Buckhead beef, Chicago Steak Company, and American Grass Fed Beef, Fairway Packing Company, West Coast Prime Meats, DryAgePro, Henkelman, and Creek Bed Country Farmacy, LLC. In-depth analysis of the dry aging beef market and estimations for the U.S. between 2014 and 2020 are presented in the report. Competitive intelligence of leading manufacturers and distributors assists understand the competitive scenario in the U.S. The market analysis for the factors that drive and restrain the growth of the market are provided. Extensive analysis of the beef industry is conducted by following key product positioning and monitoring the top competitors within the market framework. Key market players are profiled and their strategies are analyzed thoroughly, which provides a competitive outlook of the market. Dry aging beef production market share by key producers (meat processors, distributors, loin butcher companies, and end users) in the U.S. is also provided in the report. Dry aging beef was a primeval process of producing high-quality beef in the U.S. for being marketed to high-end customers. This technique offers the most unique quality of providing distinctive dry aging flavor to beef. Increased consumption of beef due to expansion in trading business also boosts the packaging business. The consumption of dry aged beef gains traction across the globe especially in the U.S., owing to the increase in the number of restaurants and willingness of specialist butchers to resort to traditional processes. The rich flavor of dry aged beef is expected to be the key driver of the dry aging beef market. Vacuum packaging bags with high transmission rate are widely used in the market. This process requires less stringent facilities, leading to potentially higher yield. The UMAi Dry technology launched by DrybagSteak, LLC. offers excellent bonding between the bag and meat surface; thereby, ensuring homogenization of the proteins on the beef’s surface with the inner layer of the vacuum bag to form a transparent layer that prevents contamination and moisture release. Dry aged beef is distributed through either direct or online sales. The direct sales channels include sales through retail shops, grocery shops, and food service suppliers. In the U.S., online sale of dry aging beef has a significant share in the distribution of the product, and is anticipated to gain traction in the near future. "U.S. Dry Aging Beef Market"